Peyalwar - 2307, 2315, 2343. We may not be able to worship at this temple. The Moolavar of this temple is believed to lie dormant amidst a lake which can be seen en route Uttiramerur Road(Eastward about a mile interior from the road). There are no Thiruvaradhanam or other procedures. The Moolavar of this sthalam is Azhagiya Singar. He is also named as Narasimhar and Muguntha Naayagan. Moolavar in Yoga Position facing East direction. Prathyaksham for Brighu Munivar. This sthalam is situated in Chennai, Tamil Nadu. 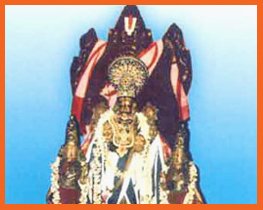 This Kshetram is considered to be more divine in Thondai Naadu Temples.